Le Canard enchaîné (French pronunciation: ​[lə kanaʁ‿ɑ̃ʃɛne]; English: The Chained Duck or The Chained Paper, as "canard" is French slang meaning "newspaper"), is a satirical weekly newspaper in France. Its headquarters is in Paris. Founded in 1915 during World War I, it features investigative journalism and leaks from sources inside the French government, the French political world and the French business world, as well as many jokes and humorous cartoons. Le Canard enchaîné does not accept any advertisements and is privately owned, mostly by its own employees. The name is a reference to Radical Georges Clemenceau's newspaper L'homme libre ("The Free Man") which was forced to close by government censorship and reacted upon its reopening by changing its name to L'homme enchaîné ("The Chained-up Man"); Le Canard enchaîné means "The chained-up duck", but canard (duck) is also French slang for "newspaper"; it was also a reference to French journals published by soldiers during World War I. The weekly was founded in 1915 by Maurice Maréchal and his wife Jeanne Maréchal, along with H. P. Gassier. It changed its title briefly after World War I to Le Canard Déchaîné ("The duck unbound", or "out of control"), to celebrate the end of military censorship of the press. It resumed the title Le Canard enchaîné in 1920. The title also conveys a double meaning, "canard" being a possible salacious rumour or whisper and "enchaîné" simply meaning linked, hence "the inside whisper". It continued to publish and grow in popularity and influence until it was forced to suspend publication during the German occupation of France in 1940. After the liberation of France, it resumed publication. It changed to its eight-page format in the 1960s. Many of the Canard's early contributors were members of the Communist and Socialist parties, but it shed its alignment with those groups in the 1920s. Its current owners are not tied to any political or economic group. It now avoids any political alignment, and has gained a reputation for publishing incriminating stories and criticizing any political party with no preference. It is also fairly anti-clerical and lampoons the nobility. The Canard does not accept any advertisements. In the 1920s, it used to advertise for free Le Crapouillot, another satirical magazine created by Jean Galtier-Boissière, a friend of Maurice Maréchal. Similarly, Le Crapouillot carried free advertisements for the Canard. Relations between the two magazines soured during the Spanish Civil War as Maréchal supported the Spanish Republican government of Madrid, whilst Galtier-Boissière remained strictly pacifist. The Canard and its format served as an inspiration for the satirical weekly magazine El Be Negre, published in Barcelona between 1931 and 1936. The pages of the Canard are peppered with satirical cartoons. Here, René Pétillon mocks wealthy businesspeople who place both their production and their capital offshore. The Canard has a fixed eight-page layout. Pages 1, 2–4 and 8 are mostly news and editorials. Page 2 carries anecdotes from the political and business world. Pages 5–7 are dedicated to social issues (such as the environment), profiles, general humour and satire, and literary, theatre, opera and film criticism. One section, called l'Album de la Comtesse, is dedicated to spoonerisms. The Canard is notable because of its focus on scandals in French governmental and business circles, although it does also cover other countries. Although they became more aggressive during François Mitterrand's presidency, major French newspapers are traditionally reluctant to challenge government corruption or pursue embarrassing scandals (the rationale being that revealing political or business scandals only profits extremists on the far-left or far-right); hence, the Canard fills that gap. The Canard publishes insider knowledge on politicians and leaks from administration officials, including information from whistle-blowers. Generally, the Canard is well informed about happenings within the world of French politics. Its revelations have sometimes brought about the resignation of cabinet ministers. Some of the information published by the Canard clearly comes from very well-placed sources, who are likely to include ministerial aides. Charles de Gaulle was a frequent target, and was known to ask, "What does the bird have to say?" (Que dit le volatile?) every Wednesday – the day Canard would roll off the presses. There are often verbatim and off-the-record quotes from major politicians, including the president and prime minister, usually aimed at another politician. The paper's international coverage has been pretty spotty, though it has improved. It relies mostly on leaks from French government services and reports from the other media. It also publishes satirical cartoons and jokes. The factual and jocular columns are cleanly delineated. Every issue includes short political news (Mare au Canards); weekly profile (Prises de Bec); news from the media world; sections of press clippings (typos and malapropisms found in the French press) Rue des petites perles and À travers la presse déchaînée; the section which highlights the two most absurd or incomprehensible sentences of the week by politicians, respectively hanging them up on the mur du çon or awarding them the noix d'honneur; as well as its Sur l'Album de la Comtesse section of comic, cryptic spoonerisms. Some features are recurring but not present in every issue, such as bogus humorous interviews (interviews (presque) imaginaires) which have been copied by many others. Across the years, it also included recurring features focusing on one or more personalities of the day. Notably during the 1960s, André Ribaud and the cartoonist Moisan created a series, La Cour, which was a parody of Louis de Rouvroy, duc de Saint-Simon's Memoirs on the Reign of Louis XIV. Charles de Gaulle was turned into the king, and the deputies and the senators into courtiers. Thus, in La Cour, François Mitterrand became the ever-scheming count of Château-Chinon. In La Cour, the king would address his subjects by means of the étranges lucarnes (strange windows), a phrase de Gaulle had employed about television. After the death of de Gaulle, La Cour became La Régence with Georges Pompidou being the regent. This followed the Memoirs of Saint-Simon, which also extend into the Regency of Philippe II, Duke of Orléans that followed the death of Louis XIV. After the death of Georges Pompidou, La Régence was stopped. Later long-running features include comical imaginary diaries such as the Journal de Xavière T. (following allegations of fake work done by Xavière Tiberi, wife of the then mayor of Paris); the Journal de Carla B. (describing Carla Bruni's bohemian-bourgeois reactions towards events involving her husband, then President Nicolas Sarkozy); the Journal de Penelope F. (in the run-up to the 2017 presidential election and following allegations of fake work by Penelope Fillon, wife of the Les Républicains candidate François Fillon). Cabu, whose Beauf character was featured in a weekly strip. It also publishes a quarterly magazine, Les Dossiers du Canard, dedicated to one subject, usually one affecting French society, or world events as seen from a French perspective. On 3 December 1973, policemen of the Directorate of Territorial Surveillance (DST), disguised as plumbers, were caught trying to install a spy microphone in the directorial office of Le Canard. The resulting scandal forced Interior Minister Raymond Marcellin to leave the government, though it is said that Marcellin was a scapegoat for other members of the government, especially the Defense Minister, who was intent on knowing the identities of informers for the newspaper. A series of articles accusing long-serving Gaullist minister and possible Prime Ministerial candidate Robert Boulin of involvement in dubious real estate deals was followed by Boulin's mysterious death (October 1979), presumed to be suicide. Following his death, major officials publicly accused Le Canard enchaîné of the moral responsibility for Boulin's death, and there were broad hints the government might use the reaction to the Boulin death to seek stricter libel laws, as was done in the 1930s after the suicide of Roger Salengro. Jacques Chaban-Delmas, then President of the National Assembly, who had been politically identified with Boulin for many years, told a special memorial session of the assembly that it should "draw the lessons of this tragedy, of this assassination". After meeting with President Valéry Giscard d'Estaing, Prime Minister Raymond Barre called for "meditation upon the consequences of certain ignominies", and spoke of "a baseness". President Giscard d'Estaing also added to the criticism: Boulin, he said, "was unable to resist the campaign of harassment he was subjected to. Public opinion should severely condemn any other similar campaigns." The Canard made efforts to uncover the Nazi past of former Paris chief of police Maurice Papon. The revelations by the Canard about Finance Minister Hervé Gaymard's lavish state-funded apartment led to his resignation in 2005. Fillon affair (Penelopegate): revelations which accuse Penelope Fillon, wife of politician François Fillon, of alleged fictitious employment, as her husband's parliamentary assistant for a total salary of 900,000 euros over eight years on the one hand, and as a "literary adviser" of Revue des deux Mondes on the other, in January 2017. The Canard is published by Les Éditions Maréchal-Le Canard enchaîné (Maurice and Jeanne Maréchal founded the Canard), which is privately owned; the main associates are Michel Gaillard (CEO and director of publication), André Escaro, Nicolas Brimo, Erik Emptaz and employees of the newspaper. 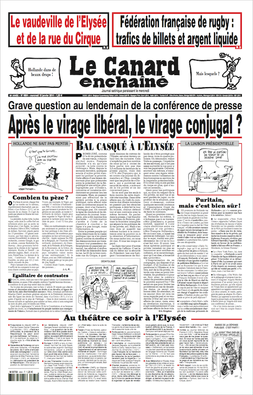 Because it does not accept advertisements (being free of sponsors), being entirely privately owned (being the same,) and because its publishing costs are met by its sales, Le Canard Enchaîné is considered one of (if not the) most objective French publications—hence its continued existence. It has a limited web presence, dependent, as it is, on selling a printed product. Despite declining newspaper circulations in France, and elsewhere, Canard is rich and growing. It owns cash reserves and property holdings worth 110 million euros. It runs cheaply and profitably, restricting itself to eight pages of two-color newsprint each week. Circulation has risen by a third since 2007 and its scandal-fuelled growth has seen a rise to 700,000 copies being printed and sold each week. Its net profit in 2009 was 5 million euros. In the film L'Armée des Ombres, directed by Jean-Pierre Melville, the character Luc Jardie (played by Paul Meurisse), while in London during the German occupation of France during World War II, imagines that his fellow countrymen will be truly liberated when they can see American films and once more read Le Canard enchaîné, alluding to the censorship of the Vichy Regime. In the TV film Notable donc coupable (2007) (translation: Well-to-do, hence guilty), the fictional weekly Le Canardeur is modelled after Le Canard enchaîné. ^ Elisabeth Cheauré; Regine Nohejl, eds. (October 2014). Humour and Laughter in History: Transcultural Perspectives. transcript. p. 80. ISBN 978-3-8394-2858-0. Retrieved 29 May 2015. Aujourd'hui (French: [oʒuʁdɥi], Today) was a daily newspaper which styled itself as "independent" and which was created in August 1940 by Henri Jeanson, to replace le Canard enchaîné under agreement with the Germans. The first issue appeared on 10 September, 1940. In November 1940, the German authorities pressured the director into taking a public position against the Jews and in favour of politics of collaboration with the Vichy regime. Jeanson resigned, and was succeeded by the journalist Georges Suarez. Aujourd'hui was far from innocent in its pursuit of those responsible for the 1940 defeat of France, resorting to the myth of the "clean sweep of the broom" in its notorious Anglophobia. It began to reflect the narrative of Marshal Philippe Pétain and of German propaganda. The paper was in favour of the Riom trials which were set up to punish the members of the pre-war government who were allegedly responsible for France's defeat in 1940. Georges Suarez was shot in 1944. Bakchich was a French news website founded in May 2006. It has some articles translated into English.The chief editor was Nicolas Beau, a former reporter at the satirical weekly Le Canard enchaîné. Its name finds its origin in the Arabic word "baksheesh", which means money given to corrupt an official in order to cut down redtape (i.e. a bribe). The newspaper advocated a leftist allegiance. The diamonds affair, known in France as "l'affaire des diamants", was a major political scandal in the 5th French Republic. In 1973, the then Minister of Finance, president Valéry Giscard d'Estaing was offered two diamonds from the Emperor of the Central African Empire, the notorious dictator Bokassa I. The affair was unveiled by the satiric newspaper Le Canard Enchaîné on October 10, 1979, towards the end of Giscard's presidency. It contributed to Giscard losing his 1981 reelection bid. Didier Hassoux is a French investigative journalist and political writer. He is the co-author of six books about French politics, and he writes for Le Canard enchaîné.During the 2017 French presidential election, center-right candidate François Fillon said his sixth book, Bienvenue Place Beauvau, suggested President François Hollande ran a shadow cabinet to spread rumours about his opponents. Hassoux denied this was the case. Edmond-François Calvo (26 August 1892 - 11 October 1957 or 1958) was a French comics artist. Born in 1892 in Elbeuf, France, he was in the army in the First World War, and started publishing cartoons in the 1920s. He had many different jobs, including working as a woodcarver and an innkeeper, until 1938, when he became a full-time artist. Most of his work had animals as the main characters, which together with his popularity and productivity gave him the nickname "The French Walt Disney".His best known work is La bête est morte (started clandestinely in 1942, published as a book after the liberation in two parts in 1944-1945), a satire on the second World War with the different countries depicted as different animals, a system that would later be used by Art Spiegelman in his graphic novel Maus. The story was written by Victor Dancette and Jacques Zimmermann, and the comic was translated in English and Dutch. Other well-known works include Patamousse (1943-1946), about a rabbit, and Rosalie from 1946, where the main character wasn't an animal but a living car. Cricri souris d'appartement became the eponymous series for Cricri magazine. His last major series was Moustache et Trottinette (1952-1958), which was continued after his death by [Jean Trubert]].He also contributed cartoons to satirical magazines like Le Canard enchaîné, and was active as a sculptor.Calvo died in 1957 or 1958 in Pont-Saint-Pierre.Calvo's graphical style, while often admired, has not really been influential. Only Albert Uderzo, the artist of Asterix, was directly influenced by Calvo after visiting him while still young. The Fillon affair (also the Penelope Fillon affair or Penelopegate) is a political-financial scandal involving allegations that family members of French politician François Fillon were given paid jobs that involved no or very little actual work. The case arose during the campaign for the 2017 French presidential election which Fillon, the candidate of the Republicans after winning the primary of the right and centre, was strongly favored to win. The affair began when the satirical weekly Le Canard enchaîné alleged in its edition of 25 January 2017 that Penelope Fillon, wife of François Fillon, received €500,000 as a parliamentary assistant to her husband and his substitute Marc Joulaud between 1998 and 2007 and in 2012. It also claimed that she was paid €100,000 as a literary adviser to the Revue des deux Mondes. The absence of evidence of work by Penelope Fillon and her distance from political life, however, led the newspaper to suspect that these jobs were fictitious. The same day, the national financial prosecutor (parquet national financier, or PNF) opened a preliminary investigation into embezzlement and misuse of public funds. On 1 February, Le Canard enchaîné published a new article in which it claimed that, including the years 1988 to 1990 and 2013, the total wages Penelope Fillon collected as a parliamentary assistant were in fact €813,440. In addition, the weekly also revealed that two of the couple's children, Charles and Marie Fillon, received €84,000 while employed from 2005 to 2007 as assistants to their father, then a Senator. On 17 February, contrary to his previous promise that he would drop his bid if placed under formal investigation, François Fillon announced he would maintain his candidacy regardless. On 14 March, he was placed under formal investigation for misuse of public funds, embezzlement, and failure to comply with transparency requirements. The investigation was subsequently extended to "aggravated fraud, forgery, falsification of records" and influence-peddling on 16 March, as investigators raised concerns that seized documents were forged in order to provide evidence of tangible work by Penelope Fillon. Frédéric Pagès (French: [paʒɛs]; born 1950) is a French journalist noted for his work with the satirical weekly, Le Canard enchaîné. Pagès studied philosophy at University and worked as a high school teacher until 1985. At Le Canard enchaîné, his humorous columns included Le Journal de Xavière T, a spoof diary of Xavière Tiberi, the wife of Jean Tiberi, then mayor of Paris, and, from December 2007, Le Journal de Carla B, a spoof diary of Carla Bruni, wife of President Nicolas Sarkozy. Henri Biard was the director of the Direction de la surveillance du territoire (DST), the French counterintelligence and domestic intelligence service from 1972 to 1974. Biard ordered DST agents to illegally wiretap the offices of Le Canard enchaîné, a French newspaper. When this decision was made public, Biard was forced to resign. Jean-François Batellier (born 1947 in Paris) is an independent "political" (in the broadest sense) cartoonist. He works in the dazibao style, frequently exhibiting his drawings on the streets. He has had many court cases concerned with the legality of so exhibiting his work. Several volumes of drawings have been published. His themes are existential questions, repression, consumption, alienation, loneliness, and high-tech living, to mention but a few. He has also published drawings in some daily newspapers like Les Échos and Le Canard enchaîné. Jean Galtier-Boissière (26 December 1891, Paris – 22 January 1966, Neuilly-sur-Seine) was a writer, polemist, and journalist from Paris, France. He founded Le Crapouillot and wrote for Le Canard enchaîné. Kimon Evan Marengo (February 4, 1904 – November 4, 1988), better known for his pen name Kem, was an Egyptian-born British cartoonist in Zifta, Egypt. He was the son of Evangelos Marangos, a Greek cotton merchant. Marengo grew up in the Greek community in Alexandria, Egypt. In his childhood he produced his own satirical hobby magazine. In 1929 he went to study at the Ecole des Sciences Politiques in Paris, graduating in 1931. He began to draw cartoons for newspapers, including Le Canard enchaîné, Le Petit Parisien, the Daily Herald and The Daily Telegraph. Marengo attended the University of Oxford in 1939, but when World War II erupted, he joined the Ministry of Information and drew 3.000 propaganda posters, leaflets, and political cartoons in various languages, including three dialects of Arabic and Persian. This included British propaganda effort to get the support of the Persians. He wrote eight books. He was also involved with the Political Warfare Executive in the French and North African and later Middle East matters. After the war Marengo went back to his studies in Oxford and graduated at the end of 1946 due to accelerated BA programme. His eventual thesis was The Cartoon as a Political Weapon in England: 1783-1832. From 1939 he designed and printed his own Christmas cards for his friends and business connections. They invariably consisted of a cartoon depicting a major political development of the outgoing year. He also imprinted on them his cartoonist coat of arms: a shield with a drawing of his face and the word 'Kem' on a green field, supported on either side by an African man in white, wearing a red fez and bandana and cocking a snook. It was topped by a coronet with the motto at the bottom, 'Apres moi le deluge'. He had two sons with his wife Una, Richard and Alexander. L'Orignal déchaîné (The Unchained Moose) is the French language student newspaper at Laurentian University in Sudbury, Ontario, Canada. Its English counterpart is Lambda. The paper was launched in 1987. Its name is a takeoff on the French satirical publication Le Canard enchaîné. Le Lynx is a weekly satirical newspaper published in Guinea. The founding director of the newspaper was Souleymane Diallo. Le Lynx is modelled after the French satirical publication Le Canard enchaîné. Williams Sassine worked as editor of Le Lynx. Luc Étienne Périn, also known as Luc Étienne, (8 September 1908 – 27 November 1984) was a French writer and a proponent of 'pataphysics. He was born on 8 September 1908, in the small town of Neuflize, in the Ardennes, and died on 27 November 1984, in Reims. After having studied in Charleville, he went on, in 1945, to teach mathematics and physics in a secondary school in Reims. In 1952, his first 'pataphysical works were published in the books of the College of 'Pataphysics, whose Regent and Chief of Practical Work he later became. He published 'The Art of the Spoonerism' in 1957, and maintained until his death a weekly section of linguistic gaffes in the French satirical newspaper, Le Canard enchaîné. In 1970, he became a member of the equally experimental Oulipo, a loose group of Francophone writers and mathematicians. Périn is most famed for his avant garde humour, and his interest in many literary facets, such as slang, palindromes, spoonerisms, Bouts-Rimés, and charades. Midi Olympique is a French bi-weekly newspaper specializing in rugby, belonging to the La Dépêche group and based partly in Toulouse and partly in Paris. The first edition was published on 2 September 1929, meaning it is one of the oldest French weekly still in existence (after Le Canard enchaîné). Jean-Michel Baylet is the director of the publication and Jacques Verdier the managing director. Nicknamed Midol or le jaune (yellow) in reference to the color of the paper is made of, it mainly covers news from rugby, from the professional Top 14 league to the amateur teams of the most modest levels (Fourth Series), and it also devotes a page to rugby league. It was published weekly on a Monday until Spring 2006 when a second edition began to be released each week on Friday. The Monday edition is nicknamed the "rouge" (red) and the Friday the "vert" (green) in reference to the different color used for the nameplate of the two editions.In 1998 Midi Olympique launched its website, which was named renamed Rugbyrama.fr in 2000 in partnership with Eurosport, and changed the formula of the newspaper under the leadership of its managing editor Jacques Verdier. In 2005, the newspaper grew to printing 140,000 copies on Monday and 120,000 of the Friday edition for a circulation of around 89,000 copies each issue, steadily increasing around 2% per year since 1999. Special issues are published at the beginning and end of the season to introduce or summarize past or future events. Every first Monday of the month, the newspaper comes with a magazine supplement, "Midi Olympique Magazine". Morvan Lebesque (January 11, 1911 in Nantes, France – 4 July 1970 in Brazil), was the Breton language name of Maurice Lebesque, a Breton nationalist activist and French journalist. Lebesque was born in Nantes, at the Quai Barbin (now dock Barbusse), and had his secondary education in Clemenceau High School. In 1930, he was editor-in-chief at the Loire Echo. Responsible for the Nantes branch of the Breton Autonomist Party (Parti Autonomiste Breton), Lebesque left the latter in 1931 and founded, with Théophile Jeusset, the more extremist movement Breiz da Zont, and its political wing, the Parti Nationaliste Breton Intégral. During the German occupation of France in World War II, he worked for the collaborationist newspaper L'Heure Bretonne, then for various journals in Paris, where he met and befriended Jean-Paul Sartre and Simone de Beauvoir. In 1952, Lebesque joined the satirical journal Le Canard Enchaîné, for which he wrote a popular column, modelling his style on Albert Camus, with whom he became a close friend. He eventually became an editor of the journal. After 1966, Lebesque also participated in the Breton autonomist revue Ar Vro. Penelope Kathryn Fillon (née Clarke; born 31 July 1955) is the wife of French politician and former Prime Minister of France François Fillon. She was the Spouse of the Prime Minister of France from 17 May 2007 to 10 May 2012. Born and raised in Wales, Fillon is a graduate of the University College London and the University of Bristol Law School. She worked as an English teacher at a secondary school in France in the late 1970s, where she met her future husband. François and Penelope Fillon married in 1980 and have five children. They are Catholic. Throughout her husband's political career, she has remained fairly uninvolved in national politics and has mostly stayed out of the public eye, and has been labelled "discreet" by the media. Despite her reputation as being private, Fillon ran for a seat on the municipal council of the Solesmes, Sarthe commune in which she and her husband reside. When François Fillon began running for the French presidency in 2017, she emerged in the public eye to campaign for her husband. Penelope Fillon rose to prominence in January 2017, when French newspaper Le Canard enchaîné published an article in which she was accused of being paid €500,000 in public money over eight years as her husband's "assistant" while performing no or very little work. The public outcry that followed led the controversy to be labelled "Penelopegate" by some, despite her husband denying any wrongdoing. Giuseppe Zaccaria (23 April 1930 – 25 August 1985), best known as Pino Zac, was an Italian illustrator, cartoonist and animator. Born in Trapani, Sicily, Zac spent his childhood in Pratola Peligna, Abruzzo and eventually moved to Rome to study architecture. In 1951 he started his professional debut with the comic strip Gatto Filippo, published in the newspaper Paese Sera until 1959. He later collaborated with a large number of European publications, including the Italian magazines Eureka and Pioniere, the French magazines L'Écho des savanes and Le Canard enchaîné, the British magazine Playtime, the Polish magazine Spillky. In 1977 he co-founded the satirical magazine Il Male, of which he also realized several covers.Zac's profane, irreverent, sometimes brutal satire caused him several complaints and legal problems. Among his favorite targets, Zac's often focused on clergymen's corruption and sexual repression. Among his works, he realized four books targeting the Catholic Church and the petty-bourgeois Italian mentality. In 2002, Nobel Prize-winner Dario Fo remembered him as "the first cartoonist in the world to draw the Pope without clothes".Zac was also active as a director and screenwriter of animation films. He realized about 20 short films and the experimental feature film The Nonexistent Knight, based on the novel with the same name by Italo Calvino.Zac died of a stroke in his house in 1985. Sorj Chalandon (born 16 May 1952 in Tunis) is a French writer and journalist. From 1973 until 2007 he worked as a journalist on Libération where, among other things, he covered events in Lebanon, Iran, Iraq, Somalia and Afghanistan. In 1988 he received the Albert Londres Prize for his articles on Northern Ireland and the Klaus Barbie trial. Since then he has worked for the satirical-investigative newspaper Le Canard enchaîné. His second novel, Une promesse (2006), won the Prix Médicis. His 2011 novel Return to Killybegs won the Grand Prix du roman de l'Académie française and was shortlisted for the Prix Goncourt.